All of the animal waste, bedding, large lots of lawn clippings and leaves and any bulk source of compostable material is gathered into a large pile. A cubic yard is pretty much the minimum workable amount. The only upper limit is space. It shouldn't be piled much over 6' high as it will compress under it's own weight and squeeze all the air out. Anaerobic decomposition produces slime and odor. To get effective composting, you need air. 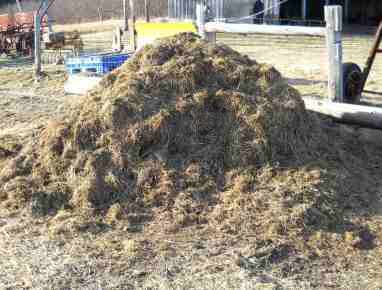 The pile grows over the Winter with little if any composting action. In the Spring, when temperatures start coming up, the pile will begin to decompose and generate heat. You can actually see steam rising from the pile on chilly mornings once it starts working. The pile will need to be turned over to re-aerate it and mix uncomposted material back into the center of the pile where the process works best. 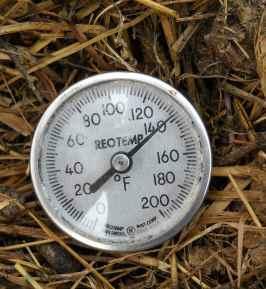 Deciding when to turn the pile is based on temperature. The bacteria that do all the work are happiest between 140 and 165 degrees Farenheit. Too cold, they don't work, too hot they die. I have a probe thermometer and check the pile daily when it's really cooking. It gets turned if it gets too hot or when it cools off from lack of compostable material in the center. Smaller amounts of compostable material such as kitchen and garden waste are gathered in bins over the Fall and Winter. In the Spring when the big pile really starts cooking, the contents of the bins are mixed in. I also compost the "leftovers" from butchering chickens. This process needs to be done VERY carefully to avoid problems with pathogens. I do it in a separate bin and I use very dry, highly absorbent, high carbon mix. Coarse sawdust from chainsawing firewood or finely chopped fall leaves work well. I rake up the sawdust after cutting wood each fall and store it for future use when I compost chicken guts. 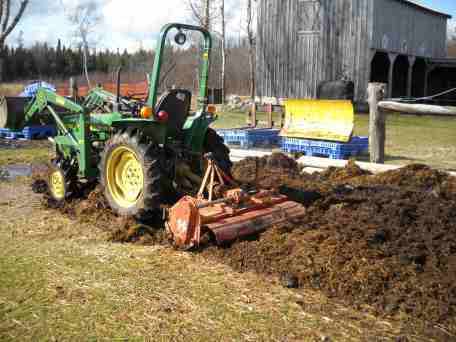 Once the pile starts working it will produce nearly finished compost in 60 to 90 days if it's managed correctly. It needs to be turned to aerate it, work new material into the center and control the temperature. You also need to keep an eye on the moisture. Too little and it won't compost, too much and it turns to slime. Mixing and aerating about once a week during the active phase is usually sufficient. Finished compost is a black, crumbly mixture with virtually no odor. The process of mixing and aerating the compost inevitably mixes rocks and other noncompostable materials into the pile. Also, you will have twigs and other uncomposted material mixed in. 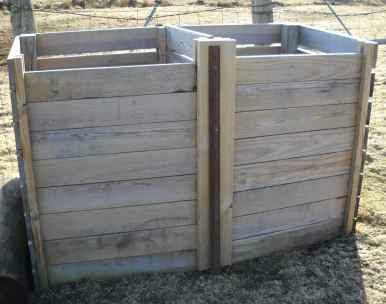 I screen the finished compost to remove such unwanted matter. I use a piece of expanded metal with 1/4" openings, and the bottom of the screen has a "funnel" made from the top of an old chick brooder that directs the screenings into a 5 gallon bucket. The whole works is driven by a snowblower engine and drivetrain which gives me variable speed and a clutch so I can start and stop it as needed. The screen portion tips forward to dump the screened out materials. 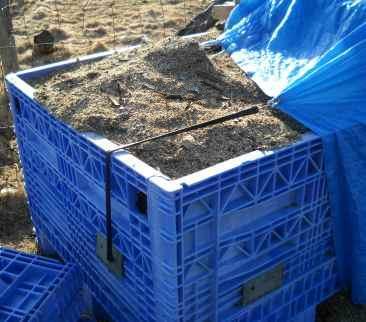 The screened compost is then bagged in poly sandbags. A 5 gallon bucket nicely fills a small sandbag. The filled bags are placed on a pallet in the front yard with a sign and a coffee can for payment on the honor system. 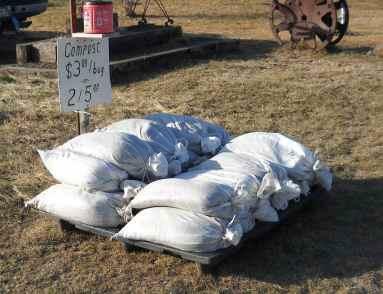 I typically sell between two and three hundred bags every Spring at $2.50 per bag.